Thousand Foot Whale Claw, an Austin 4 piece, have masterfully wrangled their mountain of synths and guitars on stage for a couple of years now. With a lineup including members of Pure X and Troller, TFWC have cut their own path, playing diverse sets of delicate minimalism to krauty trance to full-spectrum drone. They have recently released a cassette, Lost in Those Dunes, on their own Holodeck Records imprint. Having frequently witnessed their live excellence, we figured it was high time to get TFWC down on wax. 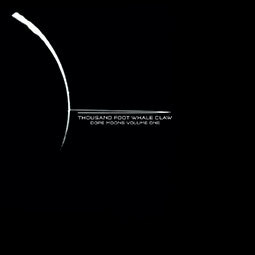 Thousand Foot Whale Claw’s vinyl debut, Dope Moons (vol. one) sneaks in through the low end, at first occupying the more out-of-the-way frequencies. Sub-sonics begin filling from the floor up, while guitar and synth shimmer and crystallize the ceiling. With the edges of this space still hard to define, Dope Moons slowly releases the flickering melody and throb needed for brief glances of the borders. Meanwhile, the room has filled-in. The blurry definition was a distraction and TFWC have set up shop right in the middle, unfurling their brand. Chattering hooks, snakey bass lines, pulsing kick and filtered strings propel this record from meditative to declarative and back. We couldn’t be happier to be putting this out. We pressed 300, and they won’t last.